Paper summary decodyng The overall goal of the paper is measure how similar different layer activation profiles are to one another, in hopes of being able to quantify the similarity of the representations that different layers are learning. If you had a measure that captured this, you could ask questions like: “how similar are the representations that are learned by different networks on the same task”, and “what is the dynamic of representational change in a given layer throughout training”? Canonical Correlation Analysis is one way of approaching this question, and the way taken by this paper. The premise of CCA is that you have two multidimensional variable sets, where each set is made up of vectors representing dimensions within that variable set. Concretely, in this paper, the sets under examination are the activation profiles of two layers (either the same layer at different points in training, or different layers in the same network, or layers in different networks). An activation profile is thought of in terms of multiple vectors, where each vector represents a given neuron’s activation value, evaluated over some observation set X. Importantly, for the two layers that you’re comparing, the set of observations X needs to be of the same length, but the layers can have different number of neurons (and, consequently, different numbers of vectors making up that layer’s multivariate set). Given this setup, the goal of CCA is to find vectors that are linear combinations of the basis vectors of each set, to satisfy some constraint. In that broad sense, this is similar to the project of PCA, which also constructs linear-combination principal components to better represent the underlying data space. However, in PCA, the constraints that define these combinations are based on one multidimensional feature space, not two. In CCA, instead of generating k principal components, you generate k *pairs* of canonical correlates. Each canonical correlate pair, (U1, V1) is a linear combination of the activation vectors of sets L1 and L2 respectively, and is chosen with the goal of minimizing the the angle (cosine) distance between the correlates in each pair. If you think about L1 and L2 each only having two activations (that is: if you think about them as being two-dimensional spaces) then the goal of CCA is to find the cosine distance between the planes defined by the two activation spaces. An important intuition here is that in this framing, vector sets that are just linear transformations of one another (scalings, rotations, swaps in the arbitrary order of activations) will look the same, which wouldn’t be the case if you just looked at raw correlations between the individual activations. This is connected to the linear algebra idea that, if you have two vectors, and a third that is just a linear combination of the first two, the span of those vectors is still just that two-dimensional space. This property is important for the analysis of neural network representations because it means it will be able to capture similarities between representational spaces that have fundamental geometric similarities, even if they’re different on a more surface level. In prior papers, CCA had been used by calculating the CCA vectors between varying sets of layers, and then taking the mean CCA value over all of the pairs of vectors. This paper argues against that approach, on the theory that network layers are probably not using the full representational capacity of their activation dimensions (think, as analogy: a matrix with three columns, that only actually spans two), and so including in your average very low-order correlations is mostly adding uninformative noise to your similarity measure. Instead, this paper weights the correlation coefficients according to the magnitudes of the correlate vectors in the pair; as best I can tell, this is roughly analogous to weighting according to eigenvalues, in a PCA setting. Using this weighted-average similarity measure, the authors do some really interesting investigations into learning dynamics. These include: * Comparing the intermediate-layer representations learned by networks that achieve low train error via memorization vs via actually-generalizing solutions, and show that, during training, the intermediate representations of generalizing networks are more similar to one another than memorizing networks are to one another. Intuitively, this aligns with the idea that there are many ways to noisily memorize, but a more constrained number of ways to actually learn meaningful information about a dataset. A super interesting implication of this is the idea that representational similarity *on the training set* across multiple bootstrapped or randomized trainings could be used as a proxy for test set performance, which could be particularly valuable in contexts where test data is limited https://i.imgur.com/JwyHFmN.png * Across networks, lower layers tend to be more similar to one another than layers closer to the output; said another way, the very simple (e.g. edge detectors) tend to be quite similar across networks, but the higher level representations are more divergent and influenceable by smaller quirks of the training set. * Within a given dataset, you can cluster learned internal representations across many training sets and recover groups trained with the same learning rate, even though the final layer softmax is inherently similar across models that achieve the same training error. This implies that metrics like this can give us some idea of the different minima that the optimization algorithm finds, as a function of different learning rates. Overall, I found this paper a great example of a straightforward idea used to clearly answer important and interesting questions, which is always refreshing amidst a sea of “tiny hack for an extra 0.05 accuracy”. Abstract: Comparing different neural network representations and determining how representations evolve over time remain challenging open questions in our understanding of the function of neural networks. Comparing representations in neural networks is fundamentally difficult as the structure of representations varies greatly, even across groups of networks trained on identical tasks, and over the course of training. Here, we develop projection weighted CCA (Canonical Correlation Analysis) as a tool for understanding neural networks, building off of SVCCA, a recently proposed method. We first improve the core method, showing how to differentiate between signal and noise, and then apply this technique to compare across a group of CNNs, demonstrating that networks which generalize converge to more similar representations than networks which memorize, that wider networks converge to more similar solutions than narrow networks, and that trained networks with identical topology but different learning rates converge to distinct clusters with diverse representations. We also investigate the representational dynamics of RNNs, across both training and sequential timesteps, finding that RNNs converge in a bottom-up pattern over the course of training and that the hidden state is highly variable over the course of a sequence, even when accounting for linear transforms. Together, these results provide new insights into the function of CNNs and RNNs, and demonstrate the utility of using CCA to understand representations. 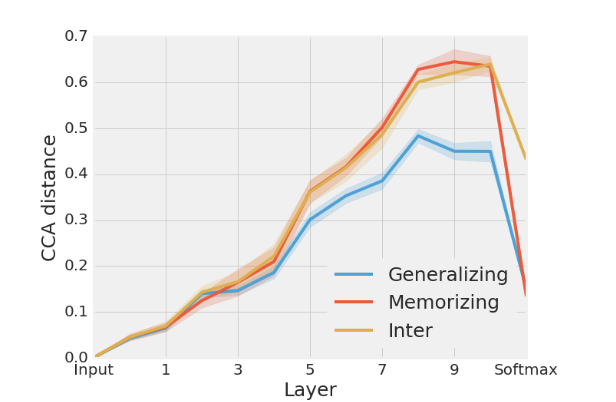 The overall goal of the paper is measure how similar different layer activation profiles are to one another, in hopes of being able to quantify the similarity of the representations that different layers are learning. If you had a measure that captured this, you could ask questions like: “how similar are the representations that are learned by different networks on the same task”, and “what is the dynamic of representational change in a given layer throughout training”? Canonical Correlation Analysis is one way of approaching this question, and the way taken by this paper. The premise of CCA is that you have two multidimensional variable sets, where each set is made up of vectors representing dimensions within that variable set. Concretely, in this paper, the sets under examination are the activation profiles of two layers (either the same layer at different points in training, or different layers in the same network, or layers in different networks). An activation profile is thought of in terms of multiple vectors, where each vector represents a given neuron’s activation value, evaluated over some observation set X. Importantly, for the two layers that you’re comparing, the set of observations X needs to be of the same length, but the layers can have different number of neurons (and, consequently, different numbers of vectors making up that layer’s multivariate set). Given this setup, the goal of CCA is to find vectors that are linear combinations of the basis vectors of each set, to satisfy some constraint. In that broad sense, this is similar to the project of PCA, which also constructs linear-combination principal components to better represent the underlying data space. However, in PCA, the constraints that define these combinations are based on one multidimensional feature space, not two. In CCA, instead of generating k principal components, you generate k *pairs* of canonical correlates. Each canonical correlate pair, (U1, V1) is a linear combination of the activation vectors of sets L1 and L2  respectively, and is chosen with the goal of minimizing the the angle (cosine) distance between the correlates in each pair. If you think about L1 and L2 each only having two activations (that is: if you think about them as being two-dimensional spaces) then the goal of CCA is to find the cosine distance between the planes defined by the two activation spaces. An important intuition here is that in this framing, vector sets that are just linear transformations of one another (scalings, rotations, swaps in the arbitrary order of activations) will look the same, which wouldn’t be the case if you just looked at raw correlations between the individual activations. This is connected to the linear algebra idea that, if you have two vectors, and a third that is just a linear combination of the first two, the span of those vectors is still just that two-dimensional space. This property is important for the analysis of neural network representations because it means it will be able to capture similarities between representational spaces that have fundamental geometric similarities, even if they’re different on a more surface level. In prior papers, CCA had been used by calculating the CCA vectors between varying sets of layers, and then taking the mean CCA value over all of the pairs of vectors. This paper argues against that approach, on the theory that network layers are probably not using the full representational capacity of their activation dimensions (think, as analogy: a matrix with three columns, that only actually spans two), and so including in your average very low-order correlations is mostly adding uninformative noise to your similarity measure. Instead, this paper weights the correlation coefficients according to the magnitudes of the correlate vectors in the pair; as best I can tell, this is roughly analogous to weighting according to eigenvalues, in a PCA setting. * Across networks, lower layers tend to be more similar to one another than layers closer to the output; said another way, the very simple (e.g. edge detectors) tend to be quite similar across networks, but the higher level representations are more divergent and influenceable by smaller quirks of the training set. * Within a given dataset, you can cluster learned internal representations across many training sets and recover groups trained with the same learning rate, even though the final layer softmax is inherently similar across models that achieve the same training error. This implies that metrics like this can give us some idea of the different minima that the optimization algorithm finds, as a function of different learning rates. Overall, I found this paper a great example of a straightforward idea used to clearly answer important and interesting questions, which is always refreshing amidst a sea of “tiny hack for an extra 0.05 accuracy”.